This month marks Royal Panda’s third anniversary, which definitely deserves a stunning promotion! Benefit from lots of spins and cash prizes during the most rewarding birthday party in the fascinating world of online gambling. The party is centered around three exciting slots, and the fun starts on the 10th of March and goes on until the 12th of March. Royal Panda adds your spins immediately to your account (refresh the slot), and Royal Spins represent a value of 141 rupees each. Earn the maximum number of spins by playing the selected slots single day (on the 10th, 11th and 12th of March). 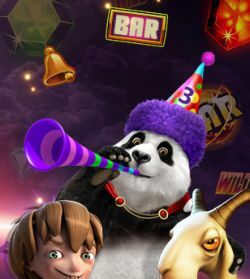 Spin the reels of this staggering online slots trio (Starburst, Twin Spin and Jack and the Beanstalk) during all three days of Royal Panda’s birthday promotion.